Welcome to this week’s best iPhone and iPad apps roundup. como sempre, prices are correct at the time of writing, e (libre + IAP) means the app is freemium and uses in-app purchases. You can read previous best iOS apps columns here, but if Android is more your thing, there’s a separate weekly roundup of the best Android apps. If you’re the kind of person who buys a cheap pair of trainers then wears them until they fall off your feet, this app isn’t for you. se, por outra banda, you can’t get enough of box-fresh sneakers and the culture around them, it’s an essential purchase – based on two books with more than 500 pairs of uber-collectible trainers to gaze at. It says “School Edition” but this could as much be “Parents Who Don’t Want In-App Purchases Edition” of this marvellous spelling app for children. Your £4.49 gets you 30 spelling lessons (con 60 more to come) hosted by characterful monsters. This app is aimed at people with “long-term health conditions” – its creator has Parkinson’s – to help them track their medication and symptoms, and show that data to family members (and perhaps doctors, and if they choose to, with the developer). This comes from Microsoft: a useful workplace tool for taking photos of documents and whiteboards, cleaning up the images, and then turning them into Word, PowerPoint or PDF files for editing and sharing. Riff is the latest experimental app from Facebook, promising the ability to “make videos with friends”. How? By filming a clip, then sharing it for friends to add their own footage, then their friends, etcétera. It’s fun, but will anyone still be using it in a couple of months’ time? If an augmented reality app that can only be used with a book written by a YouTuber strikes you as, ben, pointless, you’re very much not the audience for this. se, con todo, you’re a fan of Alfie Deyes and have just bought his second Pointless Book, the app is definitely worth a look. Expect to see the “swipe right or swipe left” approval or rejection thing from dating app Tinder to appear in different kinds of apps this year. Troov, por exemplo, is a neat way to browse furniture and home accessories from a host of UK retailers, swiping right to store the details, and left to reject them. Gokon is a neat, interesting app that wants to help you expand your circle of friends through the chance to sit down and chat with their friends – based on a Japanese tradition. You pick a venue, set a limit for the number of people, then invite friends – who can then forward that invitation. Worth a try if you’re feeling a little too socially set. A clean, simple file-sharing app here, focused on sending photos and videos to friends at their full resolution, rather than compressing them. naturalmente, you’ll want to be connected to a Wi-Fi network when using it. A specific niche: this is the official app for the magazine of the Institute of Materials, Minerals and Mining. But if materials are your thing – “metals, plastics, polymers, rubber, composites, ceramics, glasses, natural materials, wood and packaging” – then the app is a slick way to keep up to date. Attack the Light for iOS. 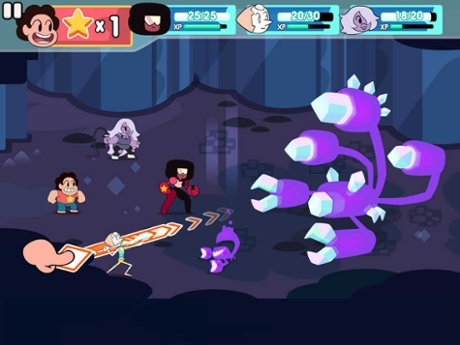 Even if you don’t watch Cartoon Network’s Steven Universe show, this is one of the most inventive, fun games of the year so far. It’s an accessible yet quirky roleplaying game featuring the show’s stars, with lots of replayability. Boss Monster had me from the initial concept: you play as a game’s boss character rather than its hero. And it’s just as fun once you get into playing it, based on a tabletop game and thoroughly rooted in retro gaming culture. Free-to-play action here from DeNA – the firm that’s working with Nintendo on that company’s first mobile games – and an all-action Marvel game. All the familiar Marvel superheroes are present and correct, as are four-player co-operative battles. Remember when name-that-tune game SongPop was a mobile and Facebook craze? Now its developer has returned with Rock On, which applies similar ideas to the history of rock music. Test your ability to quickly identify clips from the Beatles, raíña, Lynyrd Skynyrd and more, while comparing your progress to friends. Like Crossy Road meets a traditional dungeon-crawler, in short, as you swipe your hero through a dungeon packed with monsters, traps and treasure. And while its inspirations are clear, it’s very good fun. Physics-puzzlers are common on the App Store, but this one stands out from the crowd – and not just because it has the biggest bangs. It sees you stringing together increasingly-complex contraptions to blow up loot across 125 niveis, with a neat dash of humour along the way. This is getting rave reviews, but it’s a bit Marmite: you’re likely to love it or completely miss its appeal. Trippy puzzles and action that’ll last you for 60-90 actas, and either leave you feeling splendidly woozy, or cross about all the hype. A faithful port of the DuckTales game that came out for Nintendo’s NES console in 1989. It stars Scrooge McDuck – yes, he’d probably raise an eyebrow at the price – as he explores a side-scrolling platform world to find five treasures. Still good fun after all these years. Cal é a mellor bicicleta antidoblante no mercado?